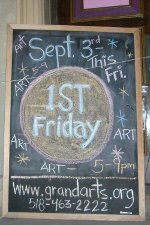 1st Friday always starts off at 6pm with a meet-up at the Monument in Washington Park. Everyone slowly rode in and began talking about different bicycle related events ABC is planning. A decent amount of riders showed up and we had a few stop by just to chat before they went off on their own rides. By 6:15 pm we set off from the Monument. The first stop on the ride was the Wine ‘n’ Diner on Delaware Ave. We spent some time there waiting for a few people to catch up from a stop at the Downtube. The art work was really interesting and the place was really busy. 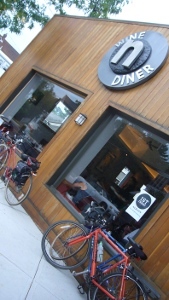 From the Wine ‘n’ Diner we headed back down Delaware riding down the newly installed sharrows, down to Davey Jones Locker (Gallery). The photography inside was fantastic, along with an awesome painting of a squirrel with a lovely miniature hamburger. We spent a good amount of time there, and by the time we started to gather to leave, the sun was getting ready to set. The next stop on the ride was Grand Street Community Arts Center, where they are getting ready for an auction later in the month. The ride down to the old church was fantastic, as we blew down the steepest part of Madison Ave. It’s usually a fun ride. 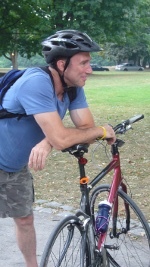 While there, we met a former NYC bike messenger who just moved to the area and hopefully will be joining us on future rides. It seems everywhere we went last night we kept running into people who rode bikes. 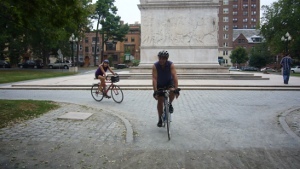 It was also great to hear that everyone knew that we met up at the monument for 1st Friday and Critical Mass. Hopefully we will see some new riders. Our third to last stop was the Broadway Art Center, where we saw some fantastic photos and had a chance to speak with the artist, who was nice enough to keep the gallery open until we had a chance to look around. The 1st Friday ride is such a great time, and its great when we ride somewhere and everyone is excited to see a pack of bikes rolling up. The second to last stop was the “Warehouse” (Marketplace Gallery) on Broadway which was one of the coolest stops, as usual. 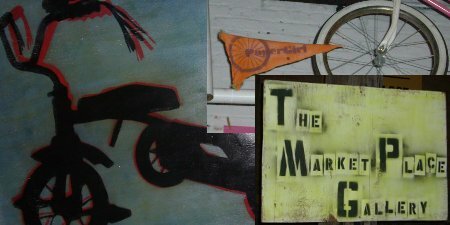 Many of us signed up for a future Papergirl ride, put on by the artist responsible for much of the bicycle art there that night. We ended the art tour here, but we continued our ride back up to Lark to spend some time getting food at Soho Pizza and having great conversation. Cheers to another awesome 1st Friday Ride. I hope to see you all at the next one. 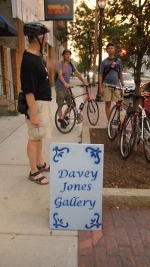 Is that David E I see in the First Friday Art Ride? Nice to know David is out riding his bicycle!